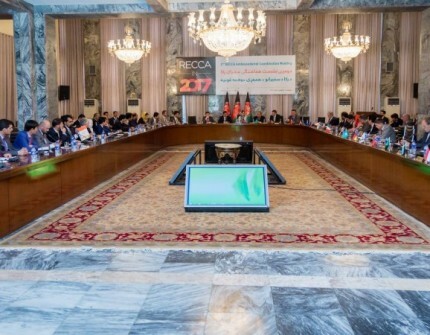 The Second RECCA Ambassadorial Coordination Meeting was held on July 10, 2017 at the Ministry of Foreign Affair of the Islamic Republic of Afghanistan in Kabul aiming at discussing the priorities and activities in the run-up to RECCA VII scheduled to take place from 14-15 November 2017 in Ashgabat as well as the commitments and priorities as outlined in the ANPDF with respect to regional cooperation. The meeting brought together ambassadors from the RECCA regional and partner countries and organizations as well as high level representatives from the line ministries and the Afghan Chamber of Commerce and Industries. The session was opened with a keynote address by Mrs. Adela Raz, Deputy Foreign Minister for Economic Cooperation. She highlighted the importance of RECCA and its new approach which includes, among others, new investment criteria including bankability and feasibility of projects, bringing synergy and complementarity between RECCA and National Priority Programs (NPPs) and ANPDF as well as among RECCA and other regional cooperation platforms. Deputy Foreign Minister Mrs. Raz also highlighted the progress made with respect to key regional projects in areas such energy, transport networks, trade and transit facilitation, communications and business-to-business partnerships. She outlined a number of challenges including infrastructure deficit, low-level of intra-regional trade, various forms of non-tariff barriers as well as the implementation bottlenecks and stressed the importance of continued collective work under RECCA in addressing the challenges and unlocking the potential for regional and inter-regional trade. Mr. H.Togalakov, Ambassador of Turkmenistan in Kabul and Mr. Hassan Soroosh, Acting Director General for Economic Cooperation shared updates on the overall preparations for RECCA VII. The meeting continued with updates and presentations on key priority projects by Mr. Nematullah Haidari, Deputy Minister for Public Works, Mr. Atiqullah Nusrat, Executive Director of ACCI and representatives from the Ministry of Transport, Ministry of Energy and Water, and the Afghan Women Chamber of Commerce and Industries. Interventions were also made during the discussions by the ambassadors and representatives from regional and international organizations.